The metrics calculations are based on nearly 2 billion views. The stats are collected from 2100+ media servers (including our Nimble Streamer, Wowza and Flussonic). HLS share still grows and it's 74% now. 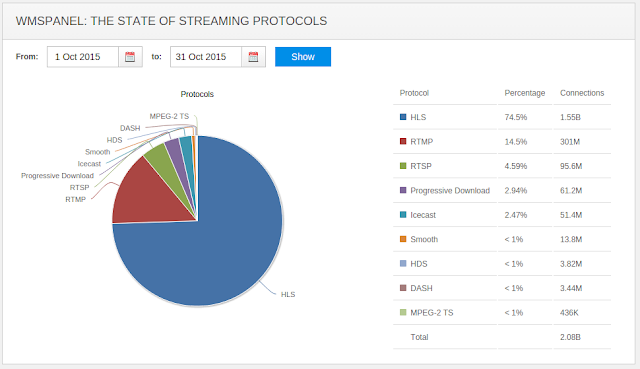 The State of Streaming Protocols - October 2015. You can compare that to September stats below. Streams recording is one of the essential use cases for live streaming. It's important to be able to view stream after the transmission is over, or switch between parts of the show during the transmission. Nimble Streamer has an excellent capabilities for handling live streams and transmuxing them from RTSP, RTMP, SRT, MPEG-TS, Icecast and SHOUTcast to any supported format like HLS, MPEG-DASH, RTMP, SRT, SLDP, RTSP and MPEG-TS. So the next step we always wanted to make is to create streams recording, also known as Digital Video Recording, or DVR. For HLS DVR playback you may have your content be packaged in both MPEG2TS and fragmented MP4 (fMP4) containers simultaneously - see the last section of this article for details. Nimble Streamer DVR allows recording and playing both HEVC (H.265) and AVC (H.264) content. Other codecs are not supported. Let's see how you can start using Nimble Streamer DVR in your environment. 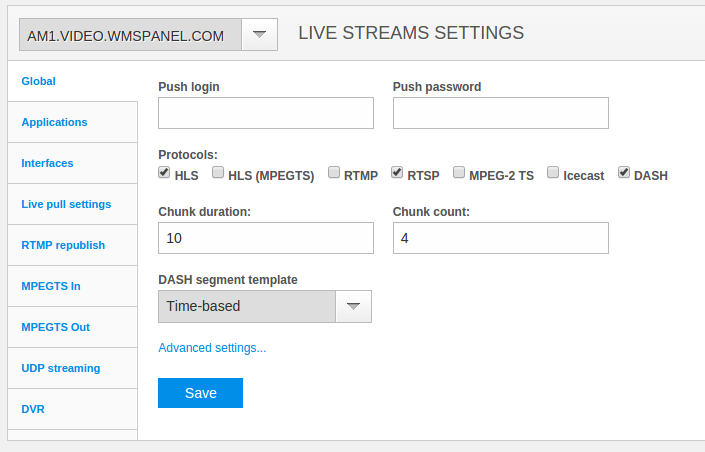 Early this year our team introduced RTSP transmuxing support for Nimble Streamer which allowed to take RTSP streams and produce HLS, DASH and MPEG-TS outgoing streams. As our customers requested, now we introduce RTSP TCP interleaved playback in Nimble Streamer which means the stream can both be played and pulled from the Nimble instance for further processing. To make this output, the Nimble Streamer instance may take the input of RTSP, RTMP and MPEG-TS protocols. Use this installation instruction to get Nimble on your server or desktop. The procedure is easy and straight-forward so having any popular 64-bit Linux, Windows or MacOS will allow you to get it working. Since you've completed WMSPanel account sign up at the previous step, you can log into the system and go to "Nimble Streamer" -> "Live stream settings" menu. The first tab you need is called "Global". Here you need to select output protocols which you will use for playback at selected server. In the following example we see HLS, RTSP and MPEG-DASH. Do you want to broadcast live video from mobile device to your own audience all over the world? The viewers might be your clients, colleagues, friends, family or everybody else you want to show the current moment of your live. Sure, that should be simple. Just point your mobile device and push the button. In this article we are going to show how to create video streaming from iOS mobile device via Larix Broadcaster. Larix Broadcaster is a free mobile application which can stream live video and/or audio to media server via RTSP protocol. In this example, we'll use Nimble Streamer because it's a freeware powerful media server with rich feature set. For the past few years, mobile devices were showing significant improvements for video creation capabilities hence the popularity of video live streaming solutions - from mobile broadcasting libraries to complex all-in-one solutions. If you create a streaming solution yourself, you need to be able to control the publication process for the protocol which you choose to work with, e.g. for RTSP or RTMP. RTSP and RTMP incoming streams were supported in Nimble Streamer for a while already among other protocols. Nimble supports both RTSP and RTMP streaming authentication server-wise as well as for specific applications. This is was done according to the standard. So if a customer needed to separate publishing permissions between his users, he needed to create separate application for each individual publisher. But when you broadcast from mobile devices, you probably will need some better way to make sure each publisher has separate permission to publish. Our customers have been using WMSAuth Paywall functionality to secure the outgoing streaming for a long time. Now to secure the incoming streams, we introduce the Publish control framework which allows performing multi-level authorization. Secure incoming and outgoing streams via Nimble Streamer.